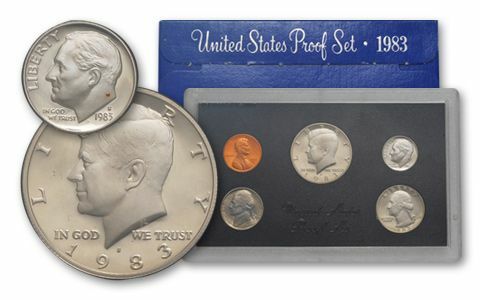 The 1983-S Proof Set invites scrutiny, because of the possibility of finding an "S"-less Dime. 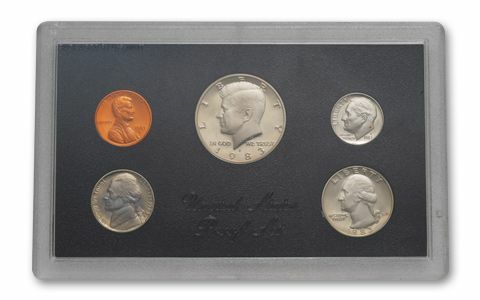 About the sets: All coins in the 1983-S Proof Set were intended to have a Cameo or Deep Cameo Finish. An unknown number of 1983-S Dimes were struck without a mintmark. This error occurred just as it had in the past, when the Philadelphia Mint failed to add a mintmark to a Proof die prior to shipment to the San Francisco Mint. The exact mintage is unknown, nor has the Mint provided an estimated mintage. However, the life of a Proof die is about 3,000 – 3,500 coins, so it would be safe to say that less than 3,500 coins exist. Original packaging: In 1983, the Mint reverted to a packaging system very close to that of 1968. 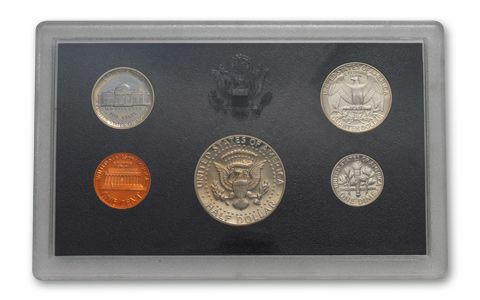 The coins of the 1983-S Proof Set were placed in individual holes in a black plastic insert, then sealed in a two-piece, clear plastic case. 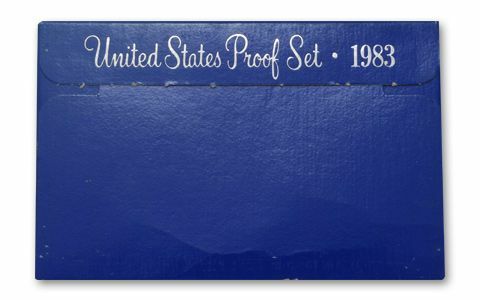 The case was then inserted into a protective outer cover, consisting of blue cardboard imprinted with the words: "United States Proof Set • 1983." Astronaut Sally Ride became the first American woman in space. The U.S. invaded Grenada to protect American students and eliminate a Cuban military presence. Terrorists bombed the U.S. Embassy in Beirut, Lebanon. Russia shot down a South Korean Airliner after the plane mistakenly ventured into Russian airspace.